LinkedIn is a place where people can connect to people they know, in order to share professional experience and opportunities. Professional networking can begin at any point, even in school. Increasingly, students are relying on their mobile address book, and not their email address book, to manage their contacts. Task : Design an experience that helps college students discover and connect to their classmates, without relying on email. What does “connect with classmates” mean to college students? What are the main methods for students to discover and connect with their classmates? And is there a difference for connecting with current students vs alumni? What are the main goals when college students want to connect with classmates? What LinkedIn features do students use currently to discover and connect with classmates? Are those effective? To get a general idea of what students think of "connect with classmates" and the methods they use to connect with classmates, I created a survey and received 46 responses. Then I conducted in-depth interview with 6 students of different majors and schools to get more insights. What does "connection" mean to you ? The majority of students think of "connection" with professional connotations. Interact with the chart to see more insights. How do you currently connect with your classmates professionally? Facebook messenger and Linkedin are the most common methods. What methods do you find the most effective or pleasant to connect with your classmates professionally? It is quite interesting to see how the percentages of "In Person" & "Phone Call" raise for this question. It seems that many students do not use those methods often to connect with classmates, but find them effective/pleasant when they do use them. What does "connection" mean to students? How do students develop connection with their classmates? The majority of students think of "connection" with professional connotations and associate words with formality. A few students consider social connection first. When asked about professional connection, they mention that they feel most comfortable to connect professionally with their friends or mutual friends. Students typically develop connection with classmates naturally through team projects instead of direct, intentional reaching out / networking. They learn from their teammates along the collaboration experiences. What do students value of their connections with classmates? What are the main goals when they try to connect with classmates? Students are interested in how their peers land on an internship or job, specifically their previous experiences, relevant skills, coursework and past projects. Similarly, many students mention that they want to know what their friends are doing at school or at work to help figure out what themselves should be doing. Students value the information sharing with their classmates about on campus opportunities such as research projects and a popular course. What are the main methods for students to discover and connect with their classmates? 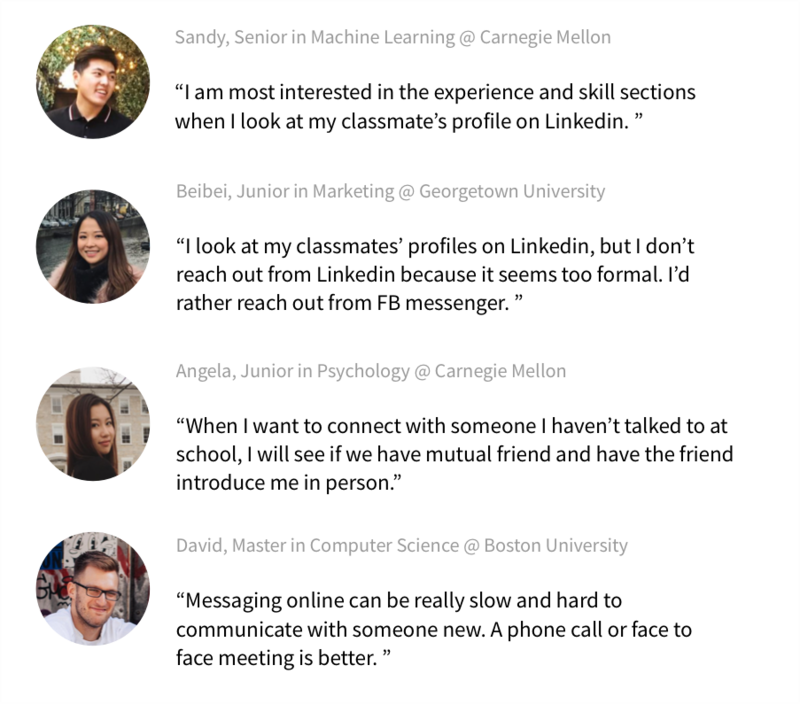 How do students use Linkedin to connect? Many use Facebook messenger to connect with classmates because of convenience and general usage. However, some concern that messenger is too informal and personal and is afraid of being associated with "stalking." Linkedin is a useful tool for students to look for connection. Students mainly use Linkedin to see classmate's profiles, with an emphasize on professional experiences and skills. However, only a few reach out directly from Linkedin because they think it is too formal to connect with classmates. Students feel most comfortable reach out if there is personal connection such as mutual friend. Although only a few connect through phone call or in person, most indicate that they find such methods efficient and pleasant. Also, many students are willing to meet in person for new connection if time and space permitted. Help students discover and connect with classmates through projects. Facilitate in person meeting for students to connect with efficiently. Revise and simplify the content of student Linkedin profile to highlight skills, course and projects that leads to professional experiences, as well as mutual friend suggestion. Problem : Olivia finds it hard to know about projects and events on campus because there is so much going on. It's also difficult to approach classmates she does not know for advice or collaboration. Opportunity : She wants to be involved with projects and events of her career interest, and learn from the people she collaborate with. Potential Entry Point : She looks at her classmates' profiles on Linkedin to see how her skills and experience compare to them for a certain internship. Based on my design goals and user persona, I proposed a potential user flow. I explored the current flow of Linkedin app and build my user flow from there to give users a familiar context, but also add new, student-targeted features to help my stakeholder Olivia to achieve her goals. Based on the needs of the user persona and my defined opportunity areas, I sketched out quick thumbnails of screens to help me further understand the user flow and overall structure. The 8 screens roughly cover the 3 key features I want to design to achieve my 3 design goals mentioned in Design Opportunity. After iterations on wireframes and brief user testing by paper sketches, I reached my final design solution : Linkedin Classmate. Linkedin Classmate is a feature that aims to bring current students of a university together both online and in person. Specifically, Linkedin Classmate has 3 key features to do so, and these key features confirm my 3 design goals based on research and user persona. The Project Page helps students discover and connect with classmates through on campus event and project opportunities. Students meet and learn from their classmates from collaboration experiences, thus naturally develop solid connection with each other. Revised, simplified content of College Student Linkedin profile to highlight coursework and projects that leads to professional experiences, as well as mutual friend and classes suggestion. Hit "View full profile" to see complete Linkedin profile. The messenger for Linkedin Classmate assists students to connect with their classmates in a simple and efficient way. 1) It facilitates in person meeting for students to establish personal connection. The messenger parse the thread conversation, and highlights time & location related items. Students can quickly set up reminder by tapping the items. 2) The messenger provides suggestion for place to meet on campus with detail info on location and business hour. 3) Messenger gives general recommendation on conversation starter, referral request and in person meeting suggestion. If given more time, I want to go in-depth to concept testing . I will storyboard the key ideas/features to conduct speed dating to see how college students react to those features, especially the new suggestion functions of Linkedin messenger. Due to time constrains, I only user tested with a limited number of students with my lo-fi paper sketches.Thus, in the future I will conduct usability test on high fidelity prototypes and thereby iterate on the high-fidelity screens more. On the other hand, I will also think through the more complex, engaging interaction process, as well as edge cases. I will perhaps use another prototyping tool - such as Principle or Origami to better prototype the interactions/motions.